I knocked these out today. nothing astounding, but a few touches I quite like. I call this fellow “Orkus Fenix” – the second I built that gun I knew I had to give him a do-rag. I’m also not usually a fan of bloody weapons, but if ever there was a time….. I did a few tattos on these orks and I must say I’m very pleased with the result of throwing a little more complimentary blue into these Bad Moonz. And I’m still loving the checks, dags and “flames” these guys like so much. so there we are, nothing earth-shattering, but it completes the unit. These look fantastic, nice work! Also, very cool to see another Bad Moons blog here! Nice one - filled with shooty orkyness - they look brilliant all together in a mob. I'd love to see your take on it too. Amazing detail work! I'm no expert, but I like what I see! Really nice stuff, I'll be using these as inspiration for my own Orks! Love the skinny check detailing and the flames! 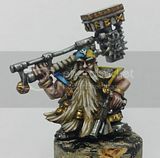 I just realized a nob can have a kombi-weapon only if he is in a nob squad. Which is rather annoying, because a kombi-skorcha in a shoota mob would be awesome! Ergo, I knew that from the moment I made the model, but I think Ork players should be able to, like marine players use combi weapons on squad leaders.. so I couldnt brung myself to remove it, its a lovely sculpt after all. Regarding the combi-weapon, screw it. Check it with your opponent before hand if it's a friendly game - any decent player should be cool with it. If you're going to a tourney, just make it very clear that it's a basic shoota and don't pay the points for it. Great looking mob - yellow is so dang hard to paint, I'm always really impressed with a good Bad Moons mob.